If you’re a chocolate fan at all, this cake does not and cannot disappoint. Molten or not, chocolate cake is a favorite around my home! Since this recipe is all about chocolate, you need the best tasting chocolate you can find. The ”no-name brands” just won’t do for this recipe. Chocolate comes from the cacao (ka-KOW) tree. The pods are hand-harvested, sorted, and fermented. Then, they’re shelled and dried (preferably by the sun). The beans are then cleaned, roasted and ground into a paste, which is the starting point for all chocolate and cocoa products. In my opinion, there are two types of chocolate: cheap and expensive! Chipits, which definitely fall in the first camp, are high in sugar. In fact, it’s the first ingredient listed, even before chocolate! They also contain artifical flavors. Couverture is very high in cocoa butter (usually a minimum of 32% cocoa butter) and expensive. It’s a professional-quality chocolate made with the best beans. You can buy couverture at finer grocery stores or chocolatiers. The best couverture is from a small artisan company in the Pisan village of Pontedera in Tuscany called Amedei. I found out about Amedei chocolate from one of the best chefs in our city, Stephen Vardy from Beckta (who's sadly moved away from Ottawa now) who I also mentioned in a previous post about orange soufflé. At one of the local cooking classes he taught, he raved about the chocolate from Amedei and highly recommended it. Since then, Amedei has won the top award called the Golden Bean for “best chocolate from bean to bar” by the London-based Academy of Chocolate for the past three years (most recently in February 2008). Amedei roasts and crushes the cocoa beans, using its own beans from a farm in South America that grows Criollo and Trinitario trees. Criollo trees are the most prized, rare, and expensive cacao trees due to their complex, fruity flavor. 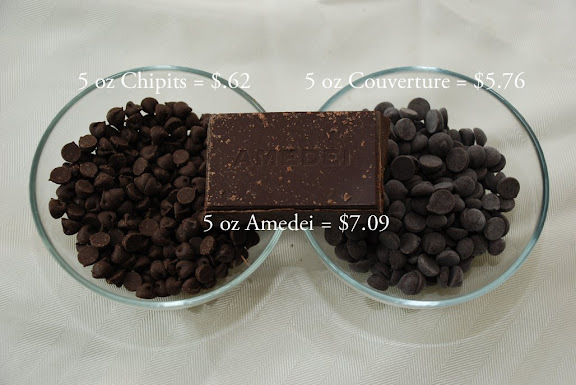 Amedei chocolate is the Dom Perignon of the chocolate world. And I was about to bake a gooey chocolate cake with it! There are only a few stores in Ottawa that sell Amedei chocolate. At $5 per 100 grams, the best chocolate in the world isn’t cheap, but it’s worth it! The Amedei chocolate I bought was labeled as having 63% cacao. This means it has 63% chocolate flavor and 37% sugar. According to AllChocolate, the higher the % cacao, the less sweet the bar and the stronger the chocolate taste. I was told by Chef Vardy to go no lower than 63%, so I was set. Another angle to all this is semi-sweet chocolate versus bittersweet chocolate. According to this article, semi-sweet chocolate is classified as having 50-60% cacao and bittersweet as having 70-100%. What I bought fell in the semi-sweet range. I’ve seen recipes that have a mix of bittersweet and milk chocolate to counteract the bitterness. I've also been told that semi-sweet and bittersweet are interchangeable. The other chocolate puzzle piece is the cocoa powder. 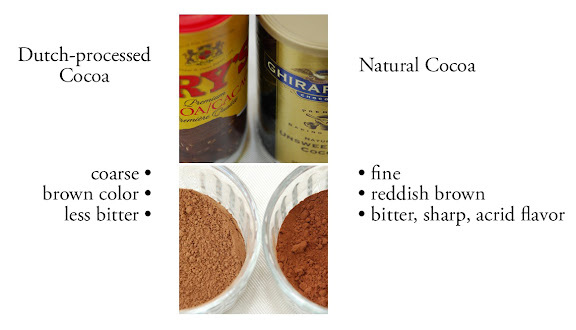 Here, there are two products to choose from: Dutch-processed cocoa powder or Natural unsweetened cocoa powder. I wondered what kind of cocoa powder was sitting in my pantry and found out it was dutch-processed. Dutch-processing was developed by a Dutch chocolate maker who found a method to eliminate the acidic (sour, bitter, acrid) components of the cocoa. In doing this, our taste buds don’t stop dead on the harshest notes, but they can taste the sweet, smooth, rich chocolate flavor. I used room temperature eggs, as suggested in the recipe. But, I wanted to know why they had to be room temperature. 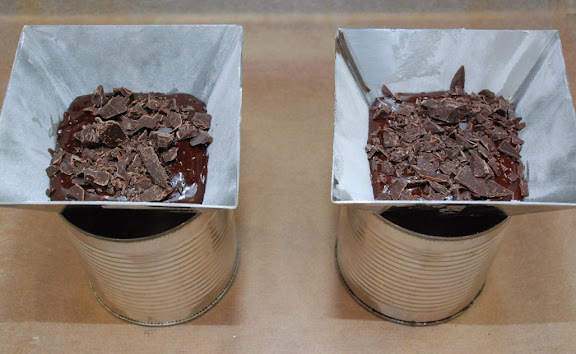 In this recipe, the butter is melted on the stove with the chocolate. Then, this mixture is drizzled into the eggs. 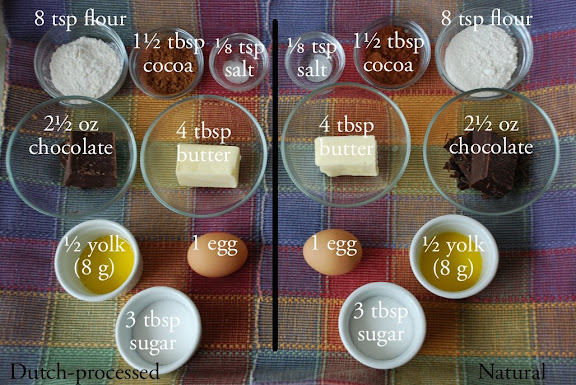 If the eggs are not at room temperature (from what I understand from Baking 911), the emulsion in the butter/chocolate mixture could break, the batter could lose air cells, and the baked cake could be grainy, flat, dry, flavorless, and possibly sink. I’ll stick with room temperature eggs. As for the salt, I’ve learned that a touch of salt brings out the flavor in anything, even chocolate. One recipe I have suggests using sea salt, which would be a nice variation. Several years ago, I was given “the pyramid kit” to go along with the cookbook Stacks: The Art of Vertical Food, and I thought this might be the perfect way to bake one of these gooey cakes. I used empty corn cans for the pyramids to sit in and put a ½ cup of batter in each and popped them in the oven. In my quest to make the best gooey chocolate cake I could, I performed an experiment: I made half the recipe with Dutch-processed cocoa powder and half with natural. I highly recommend the Dutch-processed cocoa powder. All my testers agreed that they would rather eat the cake made with the Dutch-processed cocoa powder. It was not bitter, but smooth and rich. You can find the recipe for Gooey Chocolate Cake at this blog (Lemon Tartlet) or in the book Baking: From My Home to Yours by Dorie Greenspan. To see how the rest of the TWD group fared with this week's recipe, click here and then click on each blogger! This is definitely a crowd-pleaser. I served mine with a choice of raspberry gelato, vanilla ice cream, or coffee ice cream, and a touch of whipped cream. It was delicious. This is also a great dessert for entertaining since you can make it ahead, have the ramekins (or pyramids!) all set to go in the fridge, and bake them off when you’re ready to eat them. 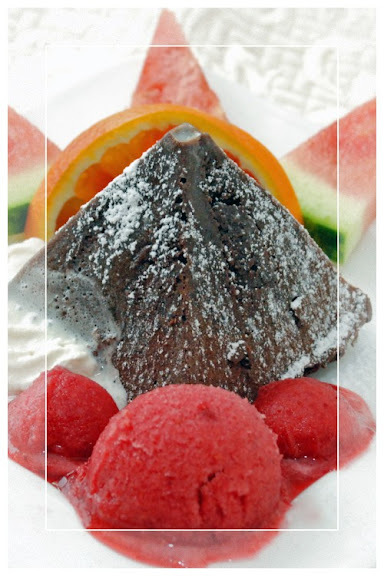 Serve this gooey chocolate cake with a dessert fruit wine, such as Southbrook Farms Framboise. The combination of raspberries and chocolate is delicious. Yours look great, nice that you did a comparison of the cocoa! Also love those pyramid shaped tins!! 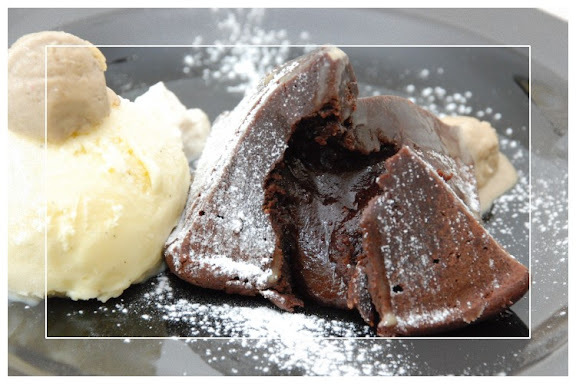 Molten chocolate cake is one of my favourites and yours looks amazing! I can't wait to try this one. What fun pyramids! Those look just adorable. I love that you take the time to find out why - and then share what you learned. Always interesting! Absolutely Gorgeous! What a difference those pans make! That is one spectacular presentation for one spectacular recipe! Your cakes look so gooey and rich, I wish I could bake these again right now! Wow!! So gooey, and great presentation - yours look incredible! Wow those pyramids are so cool. They look great! What a fabulous post, you really put your heart and soul into it! Good job! p.s. I used Scharffen-Berger's natural cocoa powder for the first time, and thought it worked out great , but I'd be curious to see if I could taste the difference between the cakes if I used Dutch-process cocoa. Amazing pictures. I loved your take. I really enjoyed reading your post. And, I learned a thing or two to boot. I have to have some of those pans. You've really got some great goo going on there! I think your cakes look fabulous! I love the shape! Very unique! Mine were more fudgy than gooey, but they did taste delicious, especially with a drizzle of muscovado toffee sauce and some clotted cream!! My boss has that cookery book stacks. It's great! Oh my goodness, I LOVE this post! All that great information about chocolate, and those wonderful pyramid molds! Great job! what a fantastic and thorough post! I love the triangle...I need to find some of those for myself. great job! WOW! That post was fantastic. So very informative. Fab job! This looks great! What a beautiful presentation- I love the shape of your cakes. Wow, very impressive and very informative! Love the pyramids! I debated on the cocoa type as well. Next time I'll use the one I didn't use this time. Make sense? The different kinds of cocoa and chocolate can provide a lot of choice. Your cakes look amazing! I love the comparison with the cocoa! Great job and beautiful pics! I love the pyramids! And I love the cakes. hubby asked for Molten Chocolate Cake for our dinner party planned later this week. I should try this recipe!